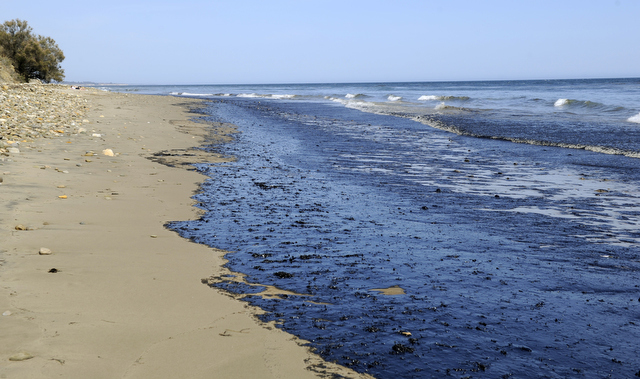 An estimated 21,000 gallon oil spill just North of Refugio State Beach coating 4 miles of the shoreline and a sheen 50-100 yards wide (May 19, 2015)..
Additional updates to this ongoing story can be found here. [UPDATE, Wednesday, 8 a.m.]: At around 11:30 a.m. Tuesday, Santa Barbara County firefighters were dispatched just west of Refugio State Beach to investigate a strong, gassy smell wafting through the area. 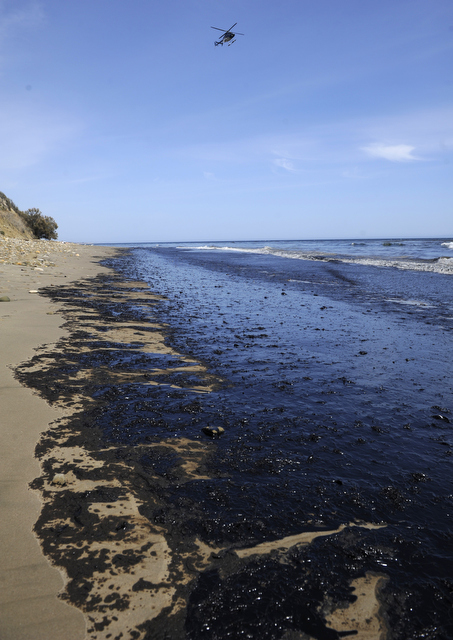 They soon discovered a river of oil spewing down a storm drain and straight into the ocean that quickly covered four miles of pristine Gaviota coastline in thick crude. The slick is expected to travel farther east before it’s stopped and cleaned in the coming days. Health officials ordered Refugio State Beach closed and its campers relocated just as oil-covered birds and other distressed wildlife began washing ashore. Fishing and shellfish harvesting has been shut down on both sides of the beach, and news helicopters showed migrating whales skirting the sheen. A family living near Orella Ranch evacuated their home because the fumes were so overwhelming. The accident has been classified by federal responders as a “medium-sized” spill and was traced to an underground pipeline a few hundred yards inland above Highway 101. The 24-inch pipe is owned and operated by Houston-based Plains All American Pipeline, which stopped the leak at approximately 3 p.m. It’s unclear how long the pipe was leaking, what caused it to break, or exactly how much crude escaped. Plains initially reported that 21,000 gallons of oil made its way into the ocean, but that number is expected to rise after county, Coast Guard, and state Fish and Wildlife personnel tally the true damage. “Plains deeply regrets this release has occurred and is making every effort to limit its environmental impact,” the company said in a statement. 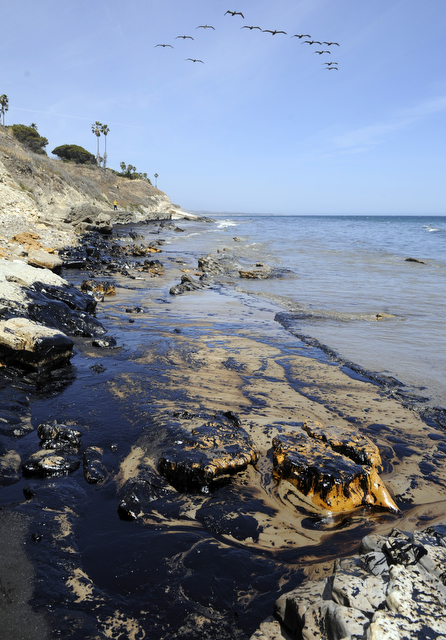 The spill is the largest in Santa Barbara since a 1997 equipment failure at platform Irene off North County polluted Surf Beach. Six cleanup boats were deploying booms and skimming the ocean Tuesday while land teams began the arduous task of stripping crude from rock and sand. “Any oil spill is devastating to the environment, but it’s nothing that we can’t recover from,” said Capt. Jennifer Williams of the U.S. Coast Guard. The broken Plains pipeline funnels 45,000-50,000 barrels of produced oil a day between ExxonMobil’s Las Flores Canyon Processing Facility near Refugio to the Plains-owned Gaviota pumping station. From there, it travels to refineries in Kern County. The 10-mile pipeline was installed in the early 1990s. Notably, it’s the only piece of energy infrastructure on Santa Barbara County land that’s not under the county’s watch. When pipe was put in, Plains successfully sued to place it under the supervision of the State Fire Marshal’s Office, arguing state management pre-empted local oversight. The pipeline hasn’t experienced any other major issues, said Kevin Drude, head of the county’s Energy Division. The life expectancy of such pipes can reach 100 years, he explained, assuming a close eye is kept on corrosion control. Drude said he was curious why the leak did not trigger an automatic shut-off as the pipe is equipped with a sensor system that can detect even the slightest change in pressure. “It’s able to pick up pinhole leaks,” he said. Tuesday night, Drude was gearing up for a site inspection at first light Wednesday morning. He said Plains had not yet provided his office with the data that will allow him calculate exactly how much oil spilled. “Earlier today, Plains All American Pipeline, L.P., became aware of a crude oil release from its 24-inch Las Flores to Gaviota pipeline in Santa Barbara County. Initial reports indicate the released oil reached a culvert leading to the Pacific Ocean. As a result, the spill has impacted ocean water and the shoreline. At this time, the amount of released oil is unknown. “Plains shut down the flow of oil in the pipeline and has initiated its emergency response plan. The culvert has been blocked so no additional oil is reaching the water. Plains is working with local officials and first responders on site to begin clean up and remediation efforts. “Plains deeply regrets this release has occurred and is making every effort to limit its environmental impact. Our focus remains on ensuring the safety of all involved. No injuries have been reported at this time. 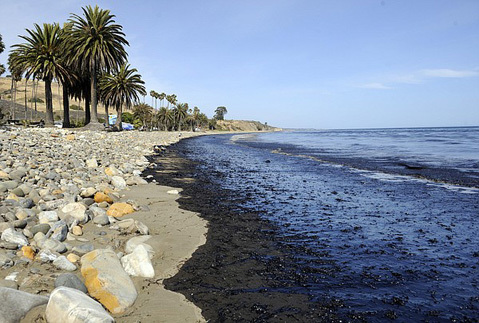 An estimated 21,000 gallon oil spill just North of Refugio State Beach coating 4 miles of the shoreline and a sheen 50-100 yards wide (May 19, 2015). [UPDATE, 6:08 p.m.]: Lt. Jonathan McCormick with the U.S. Coast Guard said an estimated 21,000 gallons of oil spilled into the ocean. That estimate comes from Plains All American Pipeline. An independent assessment has not yet been completed, he said, and it’s unknown how many gallons of crude remain on land and along the shoreline. A sheen of oil approximately four miles long and 50-100 yards wide extends south from the spill site north of Refugio State Beach. Land and ocean cleanup crews are currently working to mop up the mess. Dr. Takashi Wada, head of the County’s Public Health Department, gave the order to shut down the beach and nearby park. A warning has been issued for El Capitan State Beach as the slick continues to slowly creep south. Owen Bailey, executive director of the Environmental Defense Center, issued this statement not long ago: “Unfortunately with accidents and oil development, it is not a question of if, but of when. But to see this level of spill into such a sensitive and treasured environment is devastating to watch. These waters are known as the Galapagos of North America with numerous species of endangered whales migrating through marine protected areas and off the iconic and beloved Gaviota Coast. Abrams said cleanup contractors will calculate how much oil spilled, and that will determine how much Plains All American is fined. From here on out, he explained, the incident is being managed by the county, the U.S. Coast Guard, and the California Department of Fish and Wildlife. A command post is being set up in the area. [UPDATE, 4:15 p.m.]: The county’s Office of Emergency Management just issued an alert that the spill “stretches approximately 4 miles wide.” No evacuations have been ordered, but nearby residents have reportedly been leaving their homes voluntarily because of the strong fumes. A second cleanup vessel has arrived to start moping up the large slick on the ocean. [UPDATE, 2:48 p.m.]: The oil spill originated from a pipe operated by Plains All American Pipeline, officials on the scene said. They explained the rupture occurred north of Highway 101, and the oil leaked under the highway and railroad, onto the beach, and into the water. According to the County of Santa Barbara’s Energy Division, All American Pipeline operates two onshore pipelines that are currently in service. One, 24 inches in diameter, 10 miles long, and with a 150,000 barrel per day capacity, transports oil from ExxonMobil’s Las Flores Canyon Processing Facility near Refugio to the main All American Pipeline system at Gaviota. The other pipe transports oil from Gaviota to Kern County refineries. Calls to Plains All American Pipeline have not been returned. County firefighters were the first to discover the spill after they responded to 11:30 a.m. reports of gas smells in the area. They pinpointed the leak just north of Refugio State Beach. Tides and winds are pushing the oil slick south, responders said. A Clean Seas cleanup vessel has arrived, and a number of county, state, and federal agencies are present at the scene. 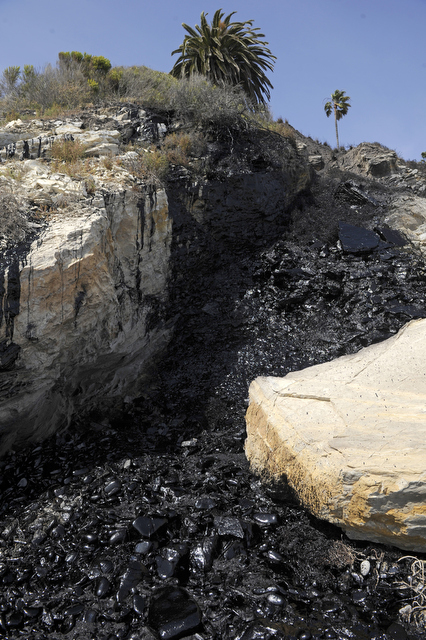 Independent photographer Paul Wellman said oil continues to seep out of the cliff face above the beach. Authorities said the source of the leak was contained at approximately 3 p.m..
[ORIGINAL REPORT]:Emergency responders are descending on the coastline near Refugio State Beach after receiving reports of an oil spill in the area. According to County Fire spokesperson Dave Zaniboni, who just arrived at the scene west of Santa Barbara, the spill originated on land from a broken pipeline. The leak has been stopped, he said, but a large oil slick has formed on the surface of the ocean. He estimated it was a half-mile long and about 100 feet wide. A large amount of oil has also collected on the beach. The smell is extremely pungent, people nearby are saying. Another responder on the scene said the pipe was leaking at a rate of “a couple hundred BMP,” or barrels per minute. It’s not clear how long oil was flowing from the pipe, or who the pipe belongs to.